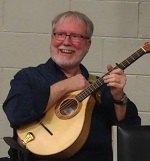 Bob MacLean, is an Event Guitarist, Celtic/Classical Guitarist and Folksinger with roots in Cape Breton (GlaceBay) and Quebec living in Guelph, Ontario. He's been playing guitar for as long as he can remember and his interest and passion for the guitar have only grown over the years. He graduated from McGill and Western in music education and classical guitar.He plays varies of music such as, folk, rock, classical and Celtic traditional. He taps into those different styles and as a result-its music to Nourish The Soul. He works as a freelance musician and focuses his energies on four different but related areas and he is passionate about all of them. As an event Guitarist, playing roots-inspired classical, pop guitar for weddings, receptions, restaurantsand mingling-type events. As a Trad-roots musician he combines his fingerstyle guitar skills and his love of East Coast/traditional music and songs. He is a frequent performer at pubs, house concerts and Trad/Celtic Festivals. He often plays with noted fiddler/conductor Fiona McCairley and long time partner in crime, Randy Jacklw.He devotes a lot of his performing time playing for seniors in independent/Assisted Living and Long Term facilities. His music fits well in: House Concerts, Pubs, Cafes, Senior Centers, Museums, East Coast/UK celebrations, Burns Suppers and St. Patrick's Parties. Over the years he performed at Celtic Colours International Festival in Cape Breton, Mill Race Festival, Fergus Scottish Festival and many more events. As a professional musician, much of his music performance work involves playing for seniors. To honor his Cape Breton roots by performing traditional songs and tunes from Atlantic Canada. He performs over 200 performances annually-more than half of them with Retirement/Assisted Living/LTC facilities acrossSouth/Central Ontario.